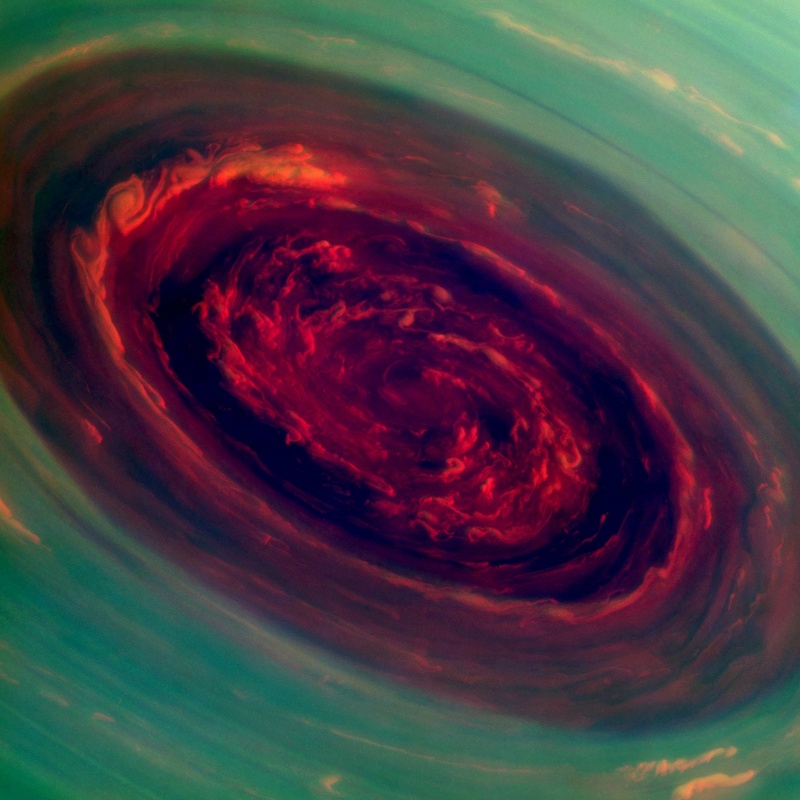 False-color imaging of Saturn’s north polar vortex. Colors correlate to different altitudes in the planet’s polar atmosphere: red indicates deep, while green shows clouds that are higher in altitude. High clouds are typically associated with locations of intense upwelling in a storm. Saturn is the sixth planet from the sun, nine-and-a-half times further from the sun than the Earth and ninety-five times more massive than Earth. 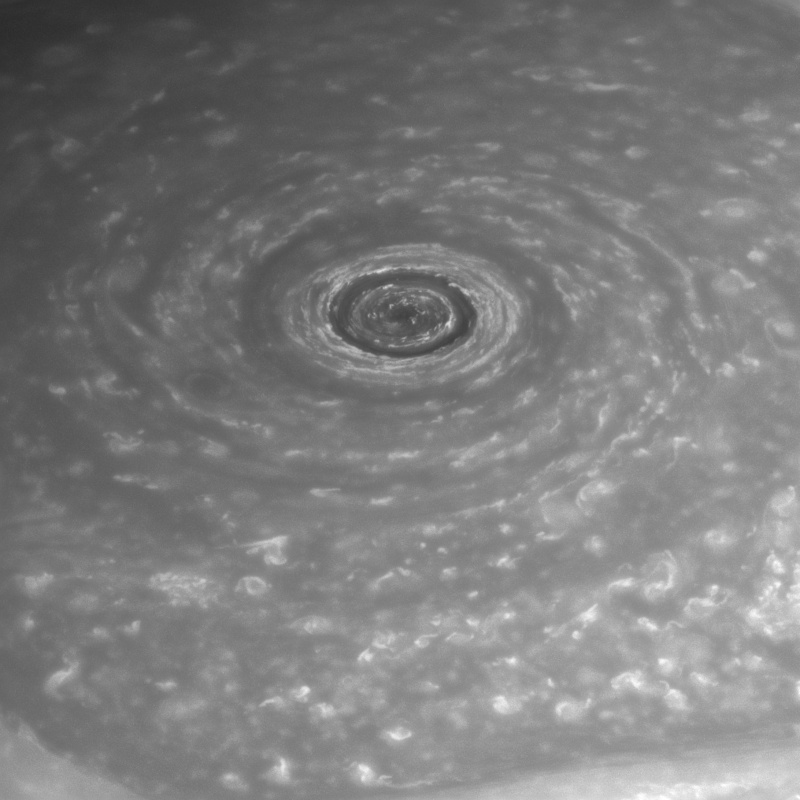 With its spectacular rings of ice and rock, Saturn has long been considered the “jewel of the solar system.” A somewhat lesser known feature of Saturn might be even more spectacular than its rings: a startlingly powerful, stationary hurricane at the north pole in the shape of a hexagon. 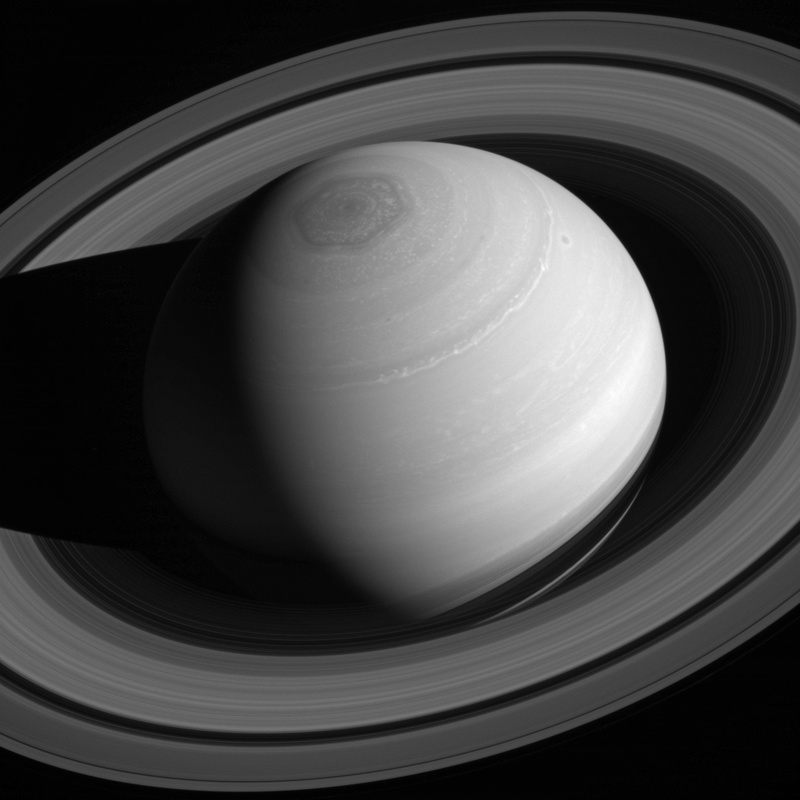 Saturn is a windy planet with speeds that can get up to and over 330 mph. At Saturn’s core, intense pressure compacts molten rock and metal to extreme temperatures, upwards of 21,000º F (twice as hot as the surface of the Sun). At Saturn’s surface, however, temperatures drop to a balmy -300° F. This drastic temperature fluctuation contributes to the constant winds that dominate Saturn’s atmosphere. 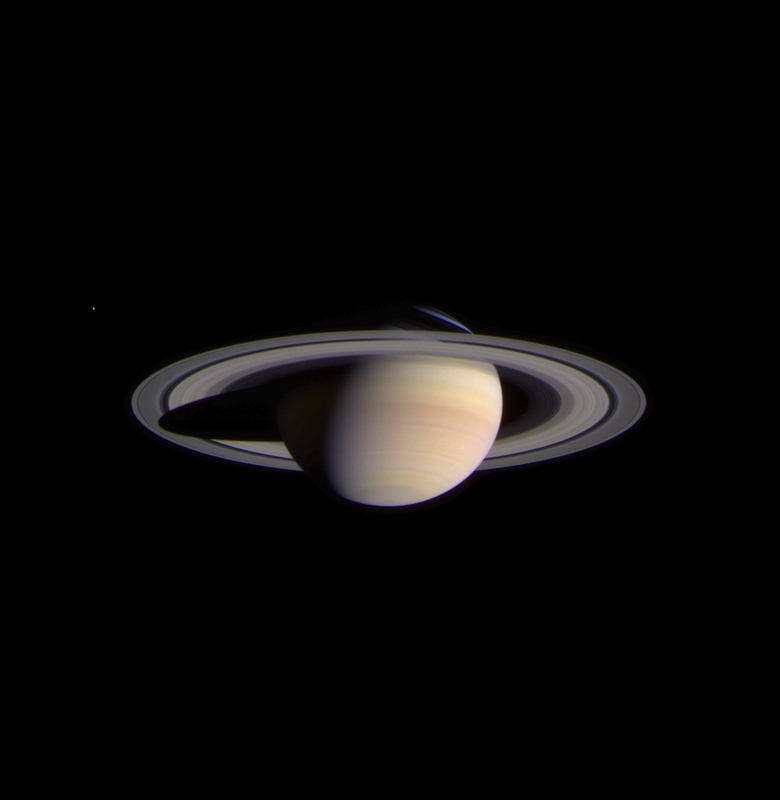 Additionally, Saturn’s rotational axis is tilted 26.7°, similar to Earth’s axis, giving it a cycle of seasons as Saturn revolves around the sun (a process that takes 29.46 Earth years to complete). As either pole spends half the Saturnian year in complete darkness, they take on unique weather patterns. Both of Saturn’s poles are dominated by massive hurricane-like vortexes with cloudless “eyes” at their centers. This movie, made from images obtained by Cassini’s imaging cameras, is the first to show the hexagon in color filters. The south pole of Saturn radiates an unusual amount of heat, much more than other areas of the planet. The cause of this is still unknown but the resulting hurricane is almost the diameter of the Earth. The eye of the southern storm is ringed by clouds up to 45 miles high. At the norther pole, however, a storm is churning unlike anything seen on any other world. The structure, which contains a churning storm at its center, is about 20,000 miles (32,000 kilometers) wide, and thermal images show that it reaches roughly 60 miles (100 km) down into Saturn’s atmosphere. Each side of the hexagonal structure is larger than the diameter of the Earth. 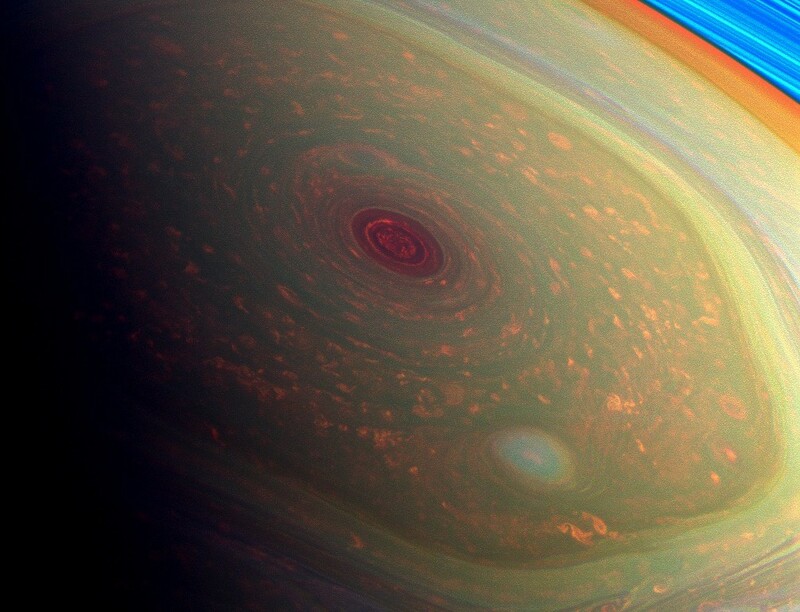 New research suggests that the scenario that best fits Saturn’s hexagon involves shallow jets at the cloud level. Small perturbations in these jets— the kind one might expect from jostling with other air currents typical of Saturn— could cause the vortex to meander into a hexagonal shape. Winds below the cloud level apparently help keep the shape of the hexagon sharp and control the rate at which the hexagon drifts. At the very center of the hexagon lies the eye, deep down in the atmosphere, an impressive 1,250 miles across with wind speeds topping 330 mph. The so-called “rose” was recently photographed by the Cassini mission which has been orbiting Saturn for the last twelve years. The false-color image shown at the right demonstrates the sharp division between the high surrounding clouds (shown in green) and the much deeper clouds of the eye (shown in red). 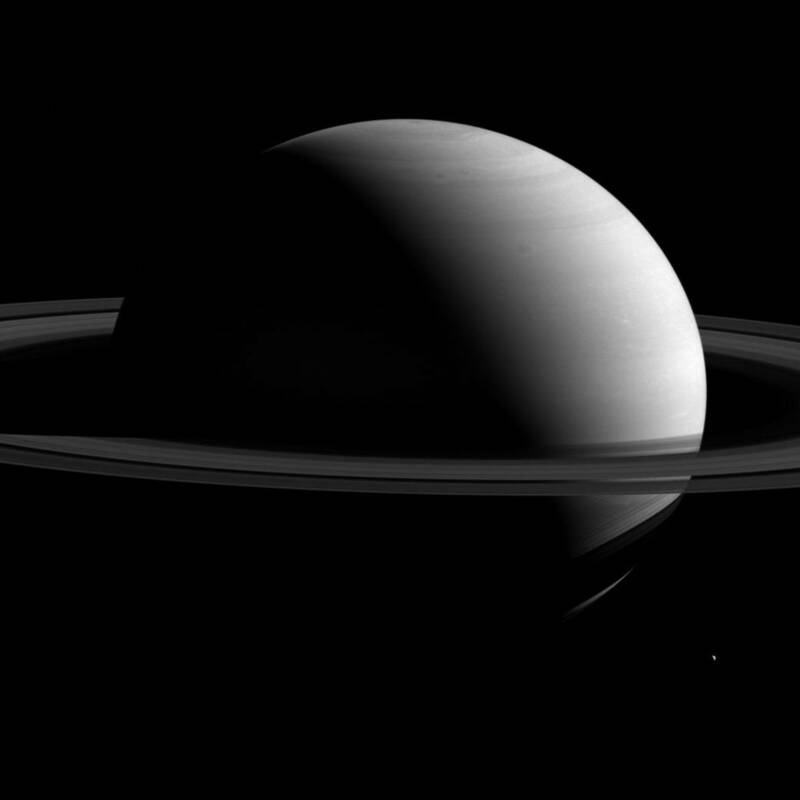 Much of Saturn still remains a mystery. With an average surface temperature of -220º F, atmospheric ammonia freezes into ice crystals, cloaking the entire planet in a layer of thin, hazy yellow clouds. 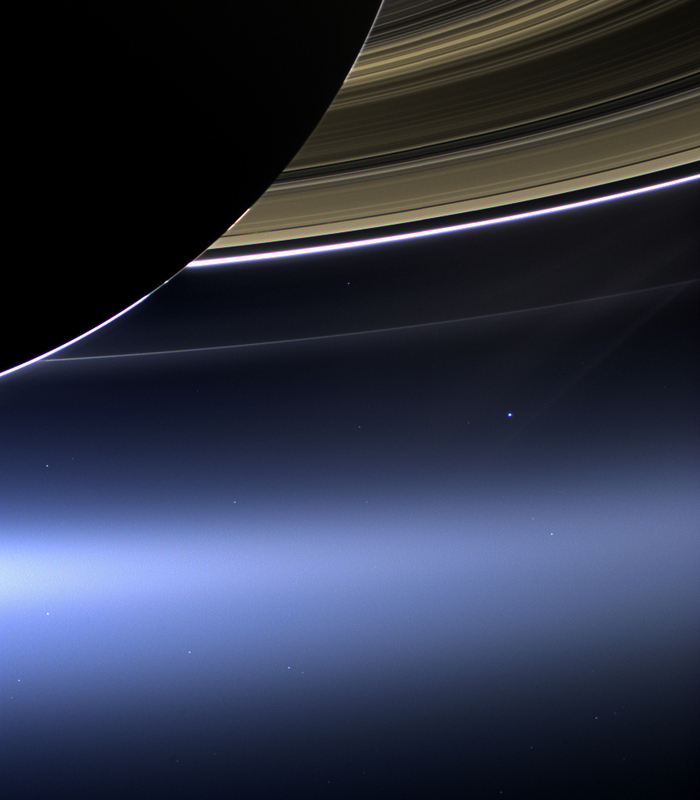 The Cassini spacecraft completed its initial four-year mission to explore the Saturn System in June 2008 and the first extended mission, called the Cassini Equinox Mission, in September 2010. Now, the healthy spacecraft is closing in on the end of its second, and final, extended mission called the Cassini Solstice Mission. At the end of 2016 and into 2017, Cassini will begin its “Grand Finale” where it will descend between Saturn and its inner rings a whopping 22 times before diving into Saturn’s violent atmosphere. The spacecraft will make detailed maps of Saturn’s gravity and magnetic fields, revealing how the planet is composed on the inside, and possibly helping to solve the irksome mystery of just how fast the interior is rotating. It will vastly improve our knowledge of how much material is in the rings, bringing us closer to understanding their origins. 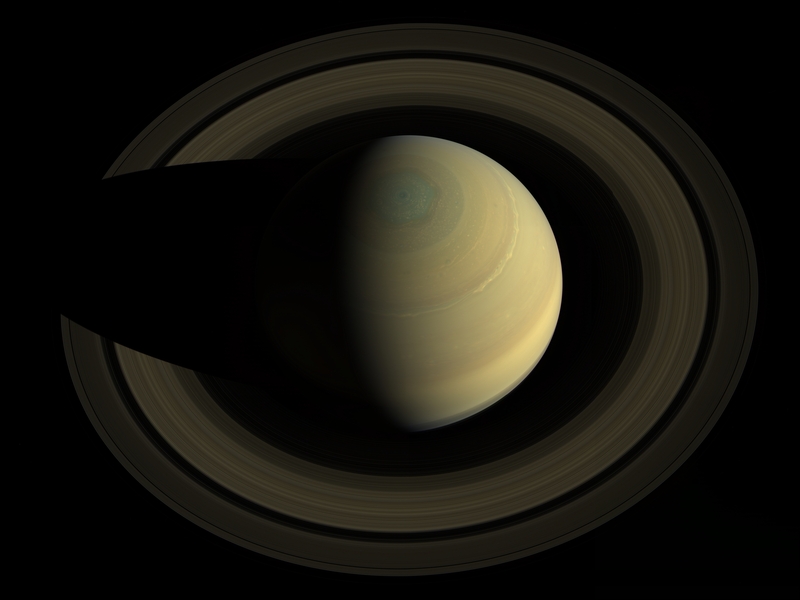 Cassini’s particle detectors will sample icy ring particles being funneled into the atmosphere by Saturn’s magnetic field. And its cameras will take amazing, ultra-close images of Saturn’s rings and clouds. There is still so much to learn about the “jeweled” planet, yet even as a mystery it still remains one of the most beautiful sights in our solar system.